As you friends know, P’tite Mignonne recently took up knitting. 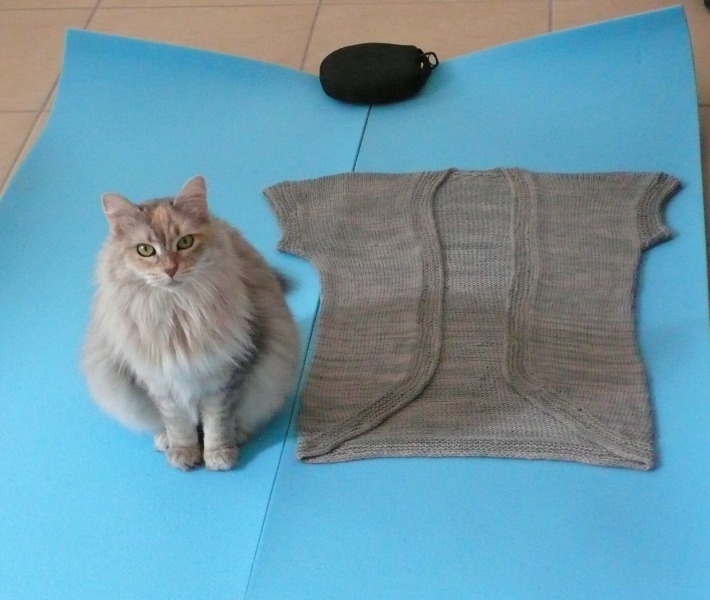 With the help of online tutorials she managed to read her way through the pattern. She was quite diligent in blocking her finished creation, although also very tempted to take a nap on it. The best part, however, is that even though she (claims she) was the one wielding the needles, I get to wear the outcome. Pattern: Abalone, a freebie by Beata Jezek, directly printable here. Yarn: Malabrigo Silky Merino (a DK weight), one of the goodies I got in London last month; in Cape Cod Gray, a shade I indeed deliberately chose to match P’tite Mignonne’s fur. You know, so her fluff doesn’t show on the knitting! 😉 And hey, it is truly gorgeous. Grey goes with lots of things, and light grey, albeit muted, is a soft and happy colour in my mind. I used 3.5 skeins (480m). Needles: US 8 – 5 mm. The one part P’tite Mignonne cannot claim as her own, though, is the top. You see, P’tite Mignonne still hasn’t mastered the sewing machine quite yet. I have decided to make myself some basic, fitted tops to layer under all the knits I (or should I say we) plan on making. 🙂 This one is a great little number from Hot Patterns, the Plain and Simple Fitted T-Shirts, which are indeed exactly that. As you can see, I have become quite enthusiastic about knitting. Well, the mere prospect of learning how to knit was hugely exhilarating from the start, and I am now super excited about this whole new creative world that has opened up for me. Tackling a cardigan as a second project may seem a little crazy, but if you’ve been reading this blog long enough – you know I am crazy that way! you can do a cardi no prob! les doigts dans le nez ;)! In fact i cant wait to see it on march 26 lol! Beautiful greys (yummy yarn). Congratulations on your first handknit wearable! Your blog says you are crazy in a talented kind of way :). Eh bien pour un coup d'essai, c'est un coup de maître 😉 P'tite Mignonne n'est pas seulement adorable, elle est aussi très douée ! J'aime beaucoup le T-shirt aussi. Beautiful knitwear and top. Ofcourse I knew it was all co-ordinated by the extremely talented Miss P'tite Mignonne she certainly needs a reward for this. Beautiful sweater and top, great job. I knew that if you create such beautiful crocheted garments, knitting would be a breeze for you. Beautiful cardigan! The Abalone is beautiful. Simple, but the edging really elevates it. I like the t-shirt too. American cats don't think abalone rhymes with Mignonne. 🙂 Still, it's a lovely color–on both you and the cat! What great work from one with no thumbs to help control the knitting needles! I love that necklace you are wearing in the photos. LOL. Looks like you both have done a beautiful job! I LOVE this post! It put a smile on my face to think about P'tite Mignonne knitting a sweater. It looks beautiful and will be a very versatile piece. What a fantastic cardigan she has made for you! It looks so versatile, like you'll be wearing it all summer long on those cool evenings. Really she just wants you to have a lovely warm layer of fluffiness like she does! Tu es une vraie pro du tricot maintenant, un autre fil à ton arc! Tu tricotes vite et bien, de quoi faire palir d'envie les novices. Pas trop eu la place de discuter cet aprèm, mais on se verra peut etre au tricot thé de la mercerie.